The official exhibitor registration for GTI Asia China Expo 2018 has already kicked off. Taking place from Sept. 12 to 14 at A Zones, Hall 1.1& 2.1 & 3.1 & 4.1& 5.1 & 6.1& 7.1 of the China Import and Export Fair Pazhou Complex in Guangzhou, China, GTI Asia China Expo is celebrating the 10th anniversary in 2018. Global buyers can get the chance to negotiate with manufacturers and find their desired products and reliable partners at GTI Asia China Expo, which will gather not only dozens of professional buyers from 65 countries and regions but also top manufacturers from the games & amusement industry. Meanwhile, buyers can also communicate or even cooperate with China and overseas manufacturers to get more information about the market and learn of the latest developing trends. 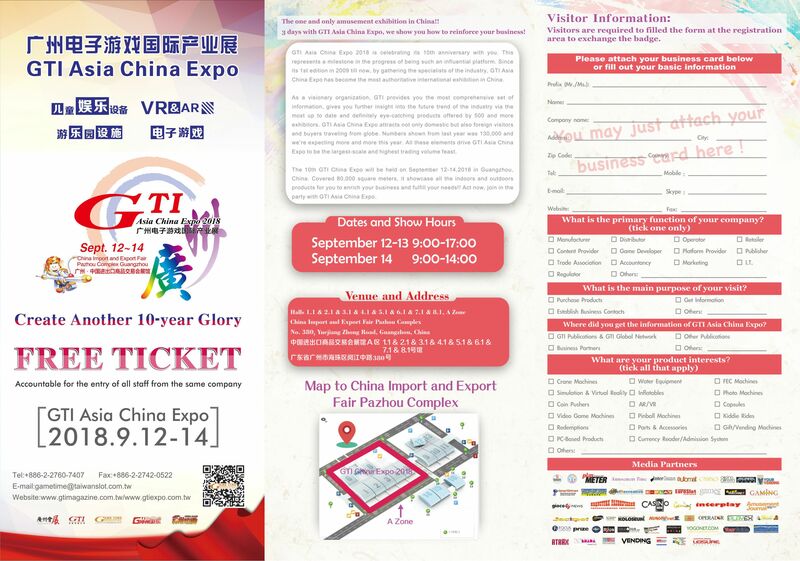 【FREE TICKETS for GTI Asia China Expo 2018】are online now available to interested visitors to plan their trips earlier and have an advanced glimpse of the newest products.